At the tail end of the festival run for Wilderness (Doherty, 2017), our feature film that has picked up 12 awards from 16 international festivals to date following its world premiere at Cinequest Film Festival in California in March 2017, my colleague Neil Fox and I met with director Ryan Mackfall to discuss a short film drama that could be produced along similar lines. Ryan had spoke about his desire to move into drama and had ideas for both a feature and short film in mind. Following a meeting in November 2017, Neil and I felt we had the time and capacity to get the short made in 2018. Neil adapted our source material, a HP Lovecraft short story, into a script under a working title of #project18, we were quick to bring in an art director and illustrator, secured locations and assembled our cast and crew in early December 2017. A complex period drama, the principal photography took place in January 2018 at a large country house in Cornwall with a crew of 17. 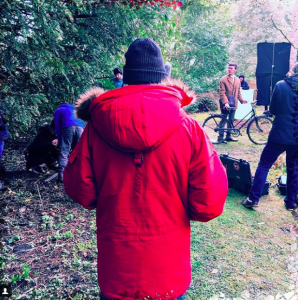 Some additional shooting took place in a country park and in a (much warmer) studio environment – BTS shots from the shoot can be found at https://www.instagram.com/ryancrashburn. Post production was completed in 2018, with the film out to festivals in 2019. RYAN MACKFALL DIRECTORS REEL 2018 from Ryan Mackfall on Vimeo.